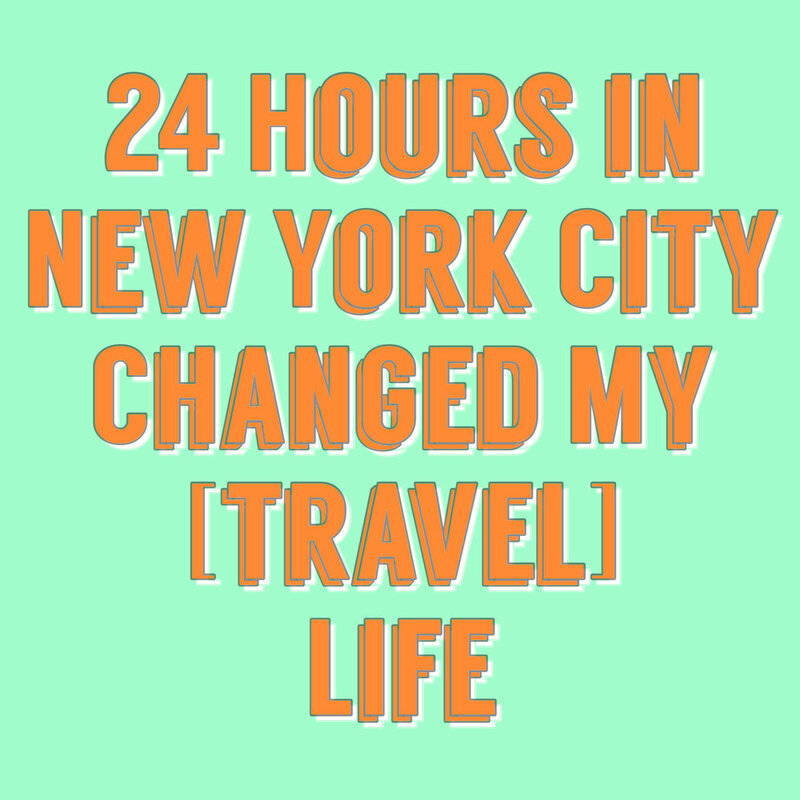 24 Hours in New York City Changed My [travel] Life — EAT. SLEEP. DISCOVER. I’ve always loved work trips. I don’t get to do them very often so the novelty of going on a free adventure to a mysterious new place hasn’t been lost amongst the mundanity of work-related objectives. One such trip brought me to the little city of Syracuse, NY. It was a drive-yourself kind of work trip so Linda tagged along for the ride. Syracuse itself didn’t seem like much fun on paper (although it did turn out to be a great shopping and food destination) but what was intriguing to me was the fact that I’d be 50% closer to New York City with a full weekend free to roam before having to return home Sunday night. I had never visited NYC before. Always wanted to, but it always seemed so daunting and expensive to plan so the Big Apple never made it’s way up my must-travel list. But this opportunity was too good to pass up so we hit the highway after my week of training and a few hours later the very rural New York State countryside became a sprawling cityscape. We did some mental math and keeping in mind the long trip home, we determined that we had 24 hours to be the ultimate NYC tourists and we were determined to check off as many of the world renowned landmarks as we could. The FAO Schwarz floor piano (RIP)? Check. The NYC Public Library? Check. As it turns out, some of these places are SO expensive to get inside! Fortunately we found out about the New York City Pass, which carries a fantastic value by the way, and got us through the gates of some of the most over-priced attractions known to man. By the end of the day, we had walked many kilometres and taken pictures of every fancy building we’d ever seen in a movie. We were exhausted. And it was not worth it. WE TOOK OUR PHOTO. NOW WHAT? The following day, we stopped in to Hoboken, NJ just because it was nearby. There was a street festival happening that day and everything there was so wonderful. The residents of Hoboken were cheerful, friendly, and full of smiles! Not to mention beautiful. Sheesh. The street was closed off to vehicles and replaced with fun games, events, and vendors of all shapes and sizes. As we ate our street food and watched the locals interact with each other, we had a moment to reflect on the vast difference in our moods that day compared to the day before. In New York City, we felt like we were marching off to battle. We were focused, prepared and determined. With each location, we checked it off the list, took our pictures and moved on to the next one with bountiful leaps and victory in our eyes! We stuffed ourselves in elevators and admissions lineups with hundreds of others to get our very own view of some famous building. In Hoboken, I don’t think we took a single picture. We just absorbed the positive energy and the good food. It was such a humble little event in a humble little city and it was the absolute highlight of our trip. Our road trip home was just over 8 hours long so we had plenty of time to reflect on what it was about the dynamics of this trip that has us reconsidering what we truly wanted out of travel. Granted, there is more to NYC than 24 hours could ever offer and the way we approached it required our war-mentality. But if I had more time to take in each spot, I wouldn’t have felt any better about it. We discovered that despite our success in killing that New York City bucket list, we felt no fulfilment from it. All we had to show for it were some photos and bragging rights. For us, there was no value in visiting these tourist hot spots and if anything it left us feeling like we’d never return to New York City. It wasn’t the city that was the problem though. It was the content that we were seeking — and everything that came with it: the crowds of tourists; the over-priced everything; the chain restaurants with bland $30 burgers; the overwhelming feeling of gluttony in the air. You can find these areas in any notable city. The memories of those 24 hours felt vapid and lacking of any valuable story to tell. In comparison, when we think of our few hours in Hoboken, our hearts warm up. We get excited and the “remember that time…” stories begin to surface until all we’re left with is a sigh of delight. We left Hoboken with an understanding of their community. We got to know the people that live there and observe how they spend their days. We tasted their food (and dang, did we enjoy it!). It was clear to us at that moment that there was far more to gain from travel than a handful of photos. This isn’t to say that we’ve become pretentious travellers that scoff at any mention of “touristy commercial areas”. No, we still like to be tourists now and then — but now we recognize that we benefit from turning left when the rest of the world turns right. And so does our wallet, incidentally. But I’ll be honest. I still catch myself looking into similar trips to this day, as if following the masses to expensive sightseeing is a time-honoured tradition, engrained in my life by ancestors long since passed. Seriously though, how can you not? It’s difficult to avoid a country’s most notorious landmark when it’s right there in the same city as you. Don’t get me wrong — there’s nothing wrong with visiting these places. In fact, it can be a worthwhile experience if it’s something you’re truly interested in. But what’s important is that you look beyond the lines of tourists and see what a country actually has to offer. What you’ll find is far greater than anything you’ll learn from a trip advisor forum. Rather than crowdsourcing your information from fellow tourists, you’ll step into new territory suggested by those that actually live there. Eat at a restaurant recommended by a local? Check! Shop at a market and sample an unfamiliar local fruit? Check! Find a great bar down a street you’ve never heard of? Check! Rent a car and explore the countryside and find a perfect sunset view? Double check! Get out there and get uncomfortable! Pretend you live there and see if you can blend in. Talk to shop owners and listen to their stories. Get recommendations. Do things your own way. Oh, the places you will go! The stories you will tell! There’s two things I’ve learned through all of this. One is that the more you get to know different types of people, the more similarities you’ll find amongst them. There’s always an expectation that we’ll find this other worldly experience when we step off a plane but aside from some different ingredients in our foods and maybe some artistic differences, we’re all seeking pretty much the same things in life. We’re really not that different after all. The second is that despite these similarities, I find myself growing and changing with every trip I take. As it turns out, there is plenty of inspiration to be found in the different cultures and personalities that you’ll encounter and personal growth becomes inevitable the further you push yourself away from those tourist zones. Those 24 hours in NYC changed me in ways that I will always be grateful for. Ironically, I participated in something that I found valueless yet it enriched my life directly in it’s process. So while I may never meet face to face with the Statue of Liberty, the very concept of such a tourist attraction has liberated me in my choice to seek out real humans instead. To take that left turn instead of the right. I encourage you to do the same! And if you’re really good, you’ll skip the taxi too.